Oil Is Toxic. So Are Dispersants! During the Gulf of Mexico oil spill, dispersants were used in very large quantities (I think the number is in the “millions of gallons” range, but I can’t find an exact figure). Remember the footage where all you saw was the broken pipe and oil gushing out. Well, if you look closely, you’ll also see a small pipe adding dispersant (white) directly to the flow of crude oil. 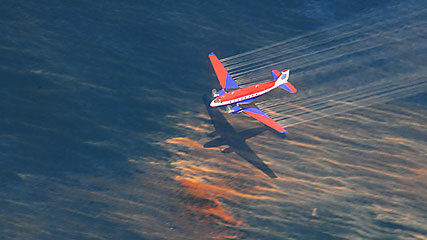 Dispersants were also added by aircraft, flying over oil patches that were floating on the Gulf. Dispersant by plane in the Gulf of Mexico. Photo: coastalcare.org. “It’s important to understand that the use of dispersants is an environmental trade-off. We know dispersants are generally less toxic than the oils they breakdown. We know that surface use of dispersants decreases the environmental risks to shorelines and organisms at the surface and when used this way, dispersants breakdown over several days. However the long term effects on aquatic life are unknown”. But some will argue that dispersants are simply a way for governments and oil companies to look like they are dealing with the problem. The oil isn’t gone, it simply isn’t seen on the surface. Out of sight, out of mind.